President Donald Trump steps off Air Force One as he arrives for the G-7 summit in Canada on June 8. Sessions has been known for his vocal opposition to marijuana legalization, calling it a "very real danger" during his Senate confirmation hearing, and saying, "Good people don't smoke marijuana." 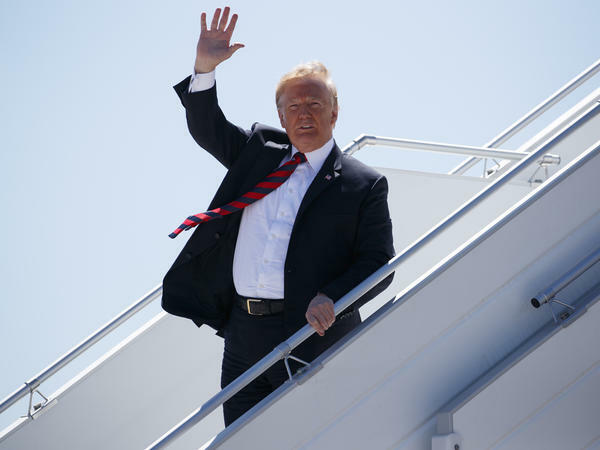 Speaking to reporters as he left the White House Friday morning for the G-7 summit in Canada, Trump said, "I probably will end up supporting" bipartisan legislation that would give states wide latitude over marijuana regulation. Asked about the proposal by Republican Sen. Cory Gardner of Colorado, Trump said, "I support Sen. Gardner. I know exactly what he's doing; we're looking at it. But I probably will end up supporting that, yes." Gardner is co-sponsoring the legislation with Massachusetts Sen. Elizabeth Warren, a Democrat. The bill would amend the federal Controlled Substances Act to allow states and tribes to write their own laws regarding the production, distribution, and possession of marijuana. Attorney General Jeff Sessions has criticized Gardner, whose state was the first to legalize marijuana, for his support for permissive marijuana laws. In April, Gardner said President Trump had promised to support such a proposal, in an apparent break with Sessions. Speaking to Colorado Public Radio on Friday, Sessions said so far Trump has not told him to back off of enforcing marijuana laws. "We were not ordered to do anything other than the policies that we intend to carry out nationally," Sessions said. Sessions said he will monitor the situation in Congress while continuing to enforce current federal law. In January, Sessions reversed an Obama-era policy that had eased up on federal marijuana enforcement in states like Colorado with permissive laws. President Trump said today that he is likely to support a bipartisan bill that would change federal law to make it easier for states to legalize marijuana. That's in contrast to the position of his attorney general Jeff Sessions at the Justice Department. Sessions and Trump have a rocky relationship largely because of the Russia investigation. NPR's Sarah McCammon covers the White House and joins us now. Hi, Sarah. SHAPIRO: What is in this bill that the president was talking about, and what exactly did the president say? MCCAMMON: So it's a proposal by Republican Senator Cory Gardner of Colorado and Democratic Senator Elizabeth Warren of Massachusetts. Those are both states that have approved the legalization of recreational marijuana. And the bill would give states more latitude to write their own laws when it comes to the production, distribution and possession of marijuana. And as a reminder, under federal law right now marijuana is a Schedule I substance. That's the same category as heroin, as LSD. And it's defined as having a high potential for abuse and also having no accepted medical use, which obviously differs from laws in many states. And for many businesses related to marijuana that have sprung up in those states where it's legal, that's a real potential problem, something that senators like Cory Gardner are concerned about. Trump was asked about that bill today as he left the White House for the G-7 summit. PRESIDENT DONALD TRUMP: I really do. I support Senator Gardner. I know exactly what he's doing. We're looking at it. But I probably will end up supporting that, yes. MCCAMMON: And it's worth noting that during the 2016 campaign Trump said he was in favor of states' rights when it comes to marijuana laws. And Gardner had said earlier this year that Trump promised to back this idea of giving states more latitude. Now the president's saying that he likely will. SHAPIRO: But as we said, the chief federal law enforcement officer, Attorney General Jeff Sessions, opposes legalizing marijuana. What has he been saying about this bill? MCCAMMON: Yes. Sessions has been the most outspoken member of the administration on marijuana. In his Senate confirmation hearings he called it very dangerous, said good people don't smoke marijuana. In January, he reversed an Obama administration policy that had eased up on federal marijuana enforcement in states with more permissive laws. And today on Colorado Public Radio, Sessions said he'll be watching what happens in Congress and noted that while the federal government generally hasn't made marijuana enforcement a big priority compared to more dangerous drugs, he says it's still illegal. JEFF SESSIONS: My view is clear that the federal law remains in effect nationwide just like it does for heroin or cocaine, and that course it's not the death-dealing drug in the same way that fentanyl or heroin is. But it remains on the books as a prohibited substance. MCCAMMON: And Sessions says so far the president hasn't directed him to do anything other than enforce federal law. SHAPIRO: But this is hardly the first time the president and his attorney general have disagreed on something. MCCAMMON: Right. Trump has publicly criticized Sessions multiple times in recent months, largely because of Sessions' decision to recuse himself from the investigation into whether the Trump campaign colluded with Russia to influence the 2016 election. That decision has angered President Trump. He tweeted recently calling the Russian witch hunt hoax - he called it a hoax and a witch hunt and said that it continues all because Jeff Sessions didn't tell me he was going to recuse himself, said he would have picked someone else if he'd known. SHAPIRO: NPR's Sarah McCammon, thanks for coming into the studio today.